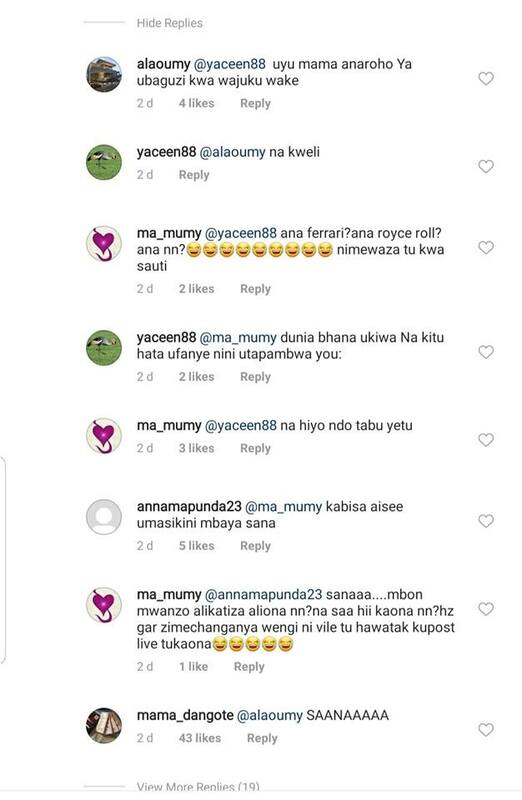 Diamond Platnumz’ mother has been harshly criticized for not sharing photos of Hamisa’s child on her social media. The singer’s mother has five grandchildren (two from her daughter Esma and three from Diamond) but she only posts four of them. She has been sharing pics of Zari and Diamond’s children Princess Tiffah and Prince Nillan. The 51-year-old grandmother has been showering them with love and recently a fan attacked her after she shared pics of Zari’s kids. The fan identified as Alaoumy questioned her on why she never posts photos of Hamisa’s son, accusing her of discriminating him. Huyu mama ana roho ya ubaguzi kwa wajukuu wake. Mrs Sandra Sanura in past interviews praised Zari, saying she respects her so much because she made Diamond a dad after he was mocked for being barren. ZARI NAMHESHIMU. NI MWANAMKE AMBAYE NDIYE WA KWANZA KABISA KUMFANYA MWANAGU AITWE BABA. NITAENDELEA KUMHESHIMU NA KUMPA HESHIMU KWA KILE ANASCHOSTAHILI. SIMKATAZI DIAMOND PLATNUMZ KUOA LAKINI SIO HAMISA. NATAKA MWANAMKE AMBAYE ANAJIHESHIMU, MWENYE HESHIA NA ANAYEJUA KUPIKA LAKINI SIO MOBETTO. Not so long ago, Diamond begged his mother not to discriminate against any of his kids, but love all of them. Previous Post: Pierra Makena on her baby daddy: Most people know who he is. It is just that I have never said it myself.